Gasteria is a genus of relatively rare, ​aloe-like succulents. It sometimes goes by the colloquial name "ox tongue," after the long, rough texture of the leaves. The plant is named for the sac-like shape of its flowers, which are supposed to resemble a stomach. The genus is native to South Africa, where it grows in lightly shaded conditions with excellent drainage. As a result, the plant tolerates lower light conditions than most other well-known succulents, making them very good houseplants. Depending on the species, gasteria leaves are often marked with interesting patterns and coloration. The G. verrucosa species also has wart-like protrusions on its leaves. Indoors, potted gasteria should be planted in bright light but not direct sunlight. Indoors gardeners find they do well in cool rooms with limited sunlight. Gasteria, like most succulents, require little water or fertilizer. Feed them once a year in the spring (both indoor plants and those in the garden). Indoor potted plants can be brought outdoors and placed in lightly shaded areas for the summer. When planted in the garden, the ideal soil will be somewhat sandy and well-drained, which will prevent root rot. Choose a bright but shady spot; dappled sunlight beneath large trees is ideal. They do not react well to water falling directly on the leaves, so you may want to provide shelter for them. Bright light, but not direct sunlight. These grow in similar conditions to Haworthia succulents. White or yellow leaves usually signify too much sun. Use a cactus mix or very fast-draining potting soil mixed with sand. For garden plantings, somewhat sandy, well-drained soils are best. Gasteria plants like more organic material in their soil than do most succulents. Mixing a bit of compost into commercial cactus mix soil can be a good idea. Water evenly and generously in the summer, but make sure the soil media dries out between waterings. In the winter, reduce watering to every other month, but do not stop watering. Never allow water to collect in between the leaves. Warmer summers but cool in the winter (down to 50 degrees Fahrenheit) are best for this plant. During warmer weather, gasteria leaves might turn a lighter, brighter color or the plant might flower with small, colorful sac-shaped flowers. Like most succulents, gasteria does not enjoy very humid environments. Fertilize during the spring with a cactus fertilizer. Don't feed during the winter. Gasteria are small, shallow-rooted, and relatively slow-growing. They are often grown in small clusters in wide, shallow dishes. Over time, clusters will naturally enlarge as the mother plant sends off small plantlets. When the cluster has outgrown its dish, repot in the spring or early summer into a new wide and shallow dish with fresh potting soil. This is also the time to take offsets for propagation. Gasteria can be propagated at repotting time using offsets from the mother plant or from leaf cuttings, depending on the species. When taking offsets, use a sharp knife or snippers and cut as close to the mother stem as you can, including as many roots as possible, then allow the offset to dry briefly before repotting it (similar to cuttings from other succulents). Pot the offsets in a small pot, using the same soil as the mother plant, and put it a warm, bright spot and make sure to provide frequent water until they begin to actively grow. There are at least 24 species of Gasteria cultivated for sale as houseplants, and with variations, cultivars, and hybrids included, gardeners have literally hundreds of choices available. Gasteria species have been in cultivation for hundreds of years and can be easily crossed with aloe which gives rise to a number of hybrids, such as gasteraloe, in addition to the species that are generally available. 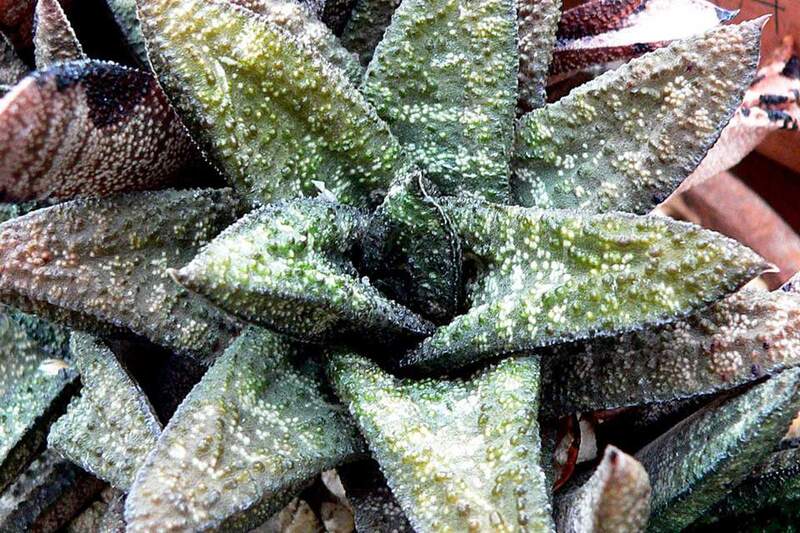 The most common Gasteria species is G. verrucosa, which has distinctive, thick and oblong leaves covered with white warts (these are known as ox tongue or lawyer's tongue). The G. maculata species is similar, but lacks the tell-tale warty protrusions. Other species include the G. glomerata, which is a small plant that stays under 2 inches tall, and the G. marmorata. Gasteria plants are susceptible to fungal infections, which usually appear as black spots on the leaves. This is the result of too much humidity or water on the leaves, but it should not spread too quickly. Gasteria plants have a natural defense mechanism against such fungal infections: They attack the invading organism and seal off the wounded spot.